Obituary for Carla Sue (Tilley) Fitzgerald | Fleming & Billman Funeral Directors, Inc.
Carla Sue (Tilley) Fitzgerald, 53 of Ashtabula died Monday (Oct. 22nd) at Cleveland Metro Hospital. She was born March 20, 1965 in Ashtabula daughter of Buddy Ray and Bonnie Jewel (Milam) Tilley, Sr.
She was a member of the American Legion Post #103 Auxiliary. She enjoyed cooking, laying on the beach in the sun, and helping others. Most of all, she loved her family especially her children and grandchildren. 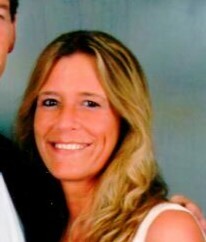 Surviving her is her husband, Dan Fitzgerald whom she married December 30, 1982; three daughters, Amber (Blake) McNeill of Covington, GA, Amanda (Kyle Hamilton) Fitzgerald of Ashtabula and Ariel (Mike DeCosse) Fitzgerald of Flowery Branch, GA; Six grandchildren, Gavin, Kennedi, Koltin, Maeson, Jaxton, and Rayna; her siblings, Debbie (Andrew) Katzmann of Ashtabula, Buddy Tilley, Jr of Ashtabula, Lorrie (Dannie) Sawyers of Kingsville, Lisa (Tim) Hughart of Ashtabula, Renee (Jeff) Hall of Salt Lake City, Utah, Kevin Fitzgerald of Ashtabula, Julie (Joe) Pyles of Ashtabula and many aunts, uncles, cousins, nieces, and nephews. She was preceded in death by her parents; her sister, Cathy Vincenzo, her sister-in-law, Edie Snyder and her mother-in-law, Darla Mae Minick. A celebration of life will be held Friday (October 26th) from 5:00 to 8:00 PM at the Ashtabula Home of Fleming & Billman Funeral Directors and Crematory, 526 W. Prospect Rd. Ashtabula, Ohio. In lieu of flowers, memorial contributions can be made to the Family c/o Ceretha Katzman.